Are we just trying to Keep Up with the Joneses? 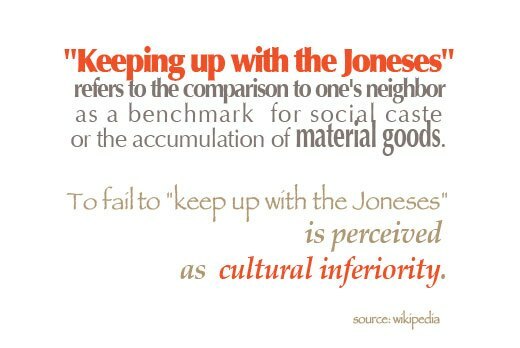 Is it true that in our society “Keeping up with the Joneses” has become more important than happiness? If you think of your goals, dreams, and wants for your life, does your list include items that simply make you happier, make you feel you are living life to the fullest or make you feel that you are growing as a person? Or does your list include items that will improve your standing in the social ladder, makes a great story to tell your friends, or is something great to show off your co-workers? Are you truly living the life you want – or simply trying to keep up with the Joneses? I would love to say that I’m purely living life to myself and my family, and the outsider opinions or views of what people think of me don’t apply or matter. But I can’t. I admit, it’s difficult. I have been thinking about this a lot lately, especially when we are on the edge of moving and are doing things in an unorthodox way. One of the things I realized as I have been getting rid of stuff – the stuff doesn’t even make me happy. I think shopping makes me happy sometimes, I love looking at things, and I was a very good personal shopper for a few years finding people exactly what they wanted. I even love online shopping and looking at things. But actually owning things, it doesn’t really make me feel happy. Experiencing things, going to places, and seeing things makes me more happy. When we first started a family, we had much more… we bought our first house, and even once built a house.. I think when we were young and we didn’t have many things, we thought having more would make us happy. You know, you’d feel “accomplished” and that owning stuff would make you feel and look “well lived”. Now at the ripe age of 36 I disagree. A life with lots of stuff makes me feel that the stuff weighs me down, and attaches me to an address like an anchor weighing me down. It is physically not easy to be open for new opportunities when you have a lot of things you own. Ironically it’s more difficult to even keep up with the Joneses and move to a better neighborhood in your own town when you have a lot of stuff. I can’t believe how freeing it has been to manage this move to Sweden with no regrets of getting rid of almost everything we owned. I may not be doing well with keeping up with the Joneses, and I’m now on the bottom step of the society cast ladder when it comes to owning shiny things, but it sure feels good to be free as a bird. Such a great post! I completely agree. When you own too much stuff, your stuff starts to own you. This is something that many struggle with even my husband and I. We had kids sooner than expected, have student loans and working class parents. SO compared to our friends with parents who can helps more and don’t have children. We have to remember what is more important which is saving and having the flexibility to eventually travel and volunteer internationally as a family. Which means modest home, car and less frills.